What So Sizzle Bout Sizzling Suzai - Malaysia Fashion, Travel and Lifestyle Blogger: No Photoshop?! Just Go to This Online Photo Editing! No Photoshop?! Just Go to This Online Photo Editing! Hey, I just can't live without the Adobe Photoshop software running in my lappy. everytime i bought a new laptop, the first thing that wonder me was that software should be install in this notebook immediately or else i die! hahaha..seriously, although sometimes i'm using the Lightroom software to simply touch-up my bunch of photos but that one is very limited. So, the story goes like this. when i'm not using my personal lappy, assuredly that software isn't there but the excitement to edit those photo to the max has blowing up. therefore, the only solution is search for the ONLINE apps. As i googled yesterday, Ta-Da!! i found this ONLINE PHOTO EDITING called as PIXLR (Photo Editing Services) at the pixlr.com . its template, buttons, layers and lot of other features are absolutely following the excellent photoshop sofware. so, surely all the photoshop user might face no problem at all to use this apps. That's a really helpful idea, not every has photoshoot so these online kits are great. 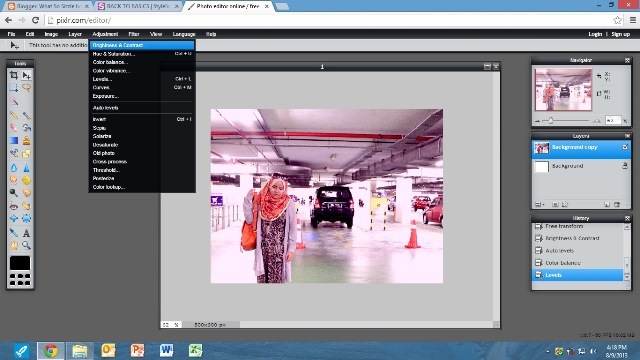 It's really great website for editing photo instant with out Photoshop or other software . thanks for sharing with us such a useful link. Online photo editing is looking natural after edit? I am using a company named Clipping Creations India for my all photo edit. Waw! Its really helpful post. Thanks for sharing your post. I needs Neck Joint Service related photo editing software. Can you tell me? How to find it? Thanks a lot for your informative post.This will help us a lot.Thank you again.